How do the photos you post on Facebook affect your social currency? How does the photography reflect your communities and how you interact with them? These are some of the issues fine art photographers will explore in “Social Currency,” an exhibition opening March 4 at STUTZARTSPACE. Showcasing a range of photography, the exhibit will look at how photographs are used and shared within communities and social networks, both online and offline. Participating artists include Andy Chen (curator), Paul D’Andrea, Lauren Ditchley, Marg Herder, Ron Kern, Aaron Law, Ginny Taylor Rosner, Satch, John Sherman, Holly Sommers, and Matt Sommers. 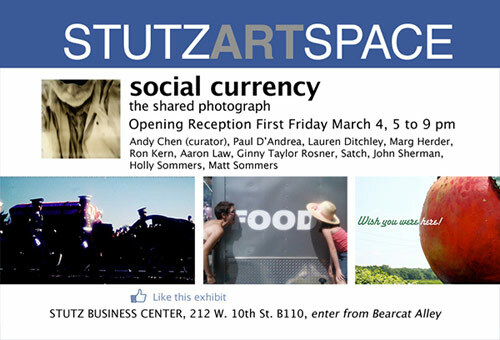 Opening reception Friday March 4th from 5 p.m. to 9 p.m. I'll also be talking about the exhibit on The Art of The Matter radio show on WFYI 90.1. Catch it this Friday @ 8pm, or Saturday at 4pm.